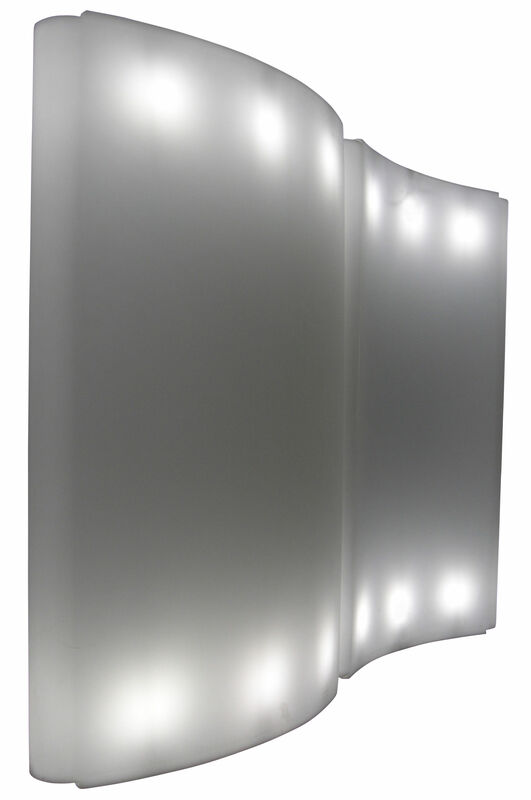 "A curved, simple and contemporary shape, sublimated by a sweet and sensual light. This folding screen in polyethylene with big dimensions (width 133 cms x H 200 cms) is at the same time decorative and very functional. It is an ideal element of separation to bound spaces, give them more intimacy, hide what we do not want to show.... "" Gio Wind "" metamorphoses your indoor spaces in an exceptional way. It exploits six light sources on all its height and diffuses a pleasant ambiance light. You can obtain a magnificent colored ligh (blue, pink, purple, orange) by using colored bulbs. This folding screen can be used alone or assembled with others to form numerous combinations of which we can easily change the dimension and the form. "